What is a Bebop Scale and Learn Why Is It Important? Are Bebop Scales the secret to unlocking the mystery of bebop improvisation for you? No. In order to truly sound authentic with bebop improvisation, you must develop a solid bebop vocabulary and incorporate staples of bebop phraseology such as: enclosures, chromaticism, triplets in between a string of eighth notes, and particular sounds like the altered harmony. So why are bebop scales important? 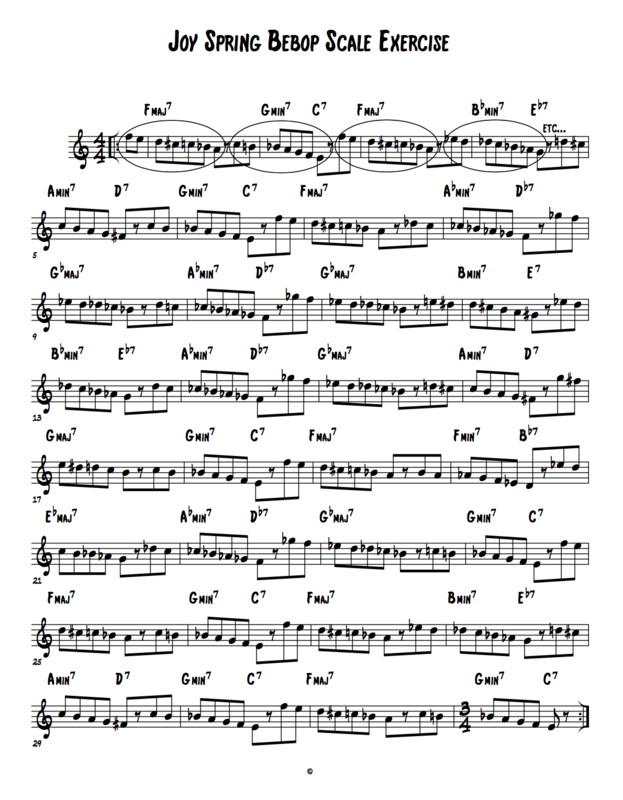 Bebop Scales are important because they teach us about melodic voice leading and the importance of harmonic timing. A bebop scale is an 8-note scale with an inserted chromatic note. That inserted chromatic note varies based on whether it is a major bebop scale, dominant bebop scale, or a minor bebop scale. But no matter which bebop scale it is, that inserted chromatic note is what gives the scale good built-in harmonic timing. Good harmonic timing refers to playing chord tones on strong beats (downbeats) and passing tones on weak beats (offbeats). The bebop scale is a good, basic way to begin incorporating chromaticism with good harmonic timing because the chromatic note of the bebop scale is inserted at the perfect spot to ensure the chord tones land on downbeats. 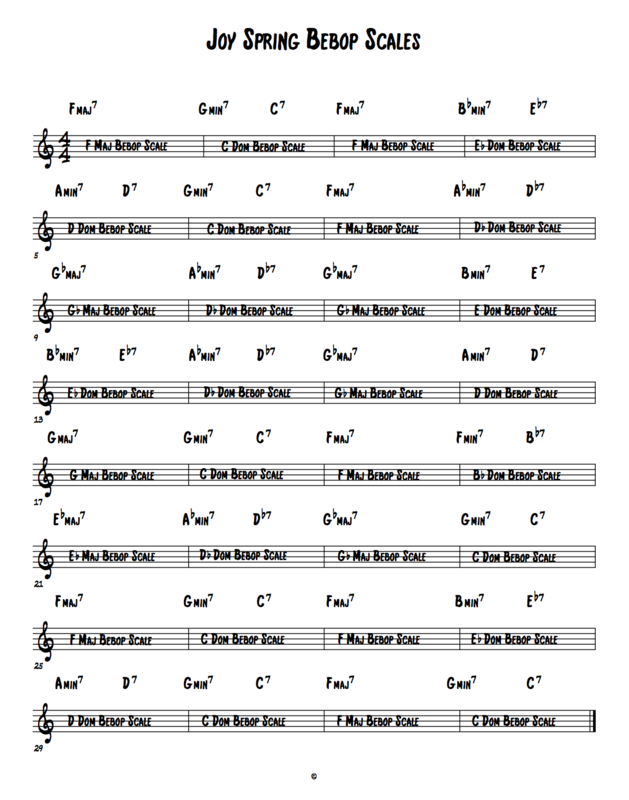 A Major Bebop Scale is based off the 7-note major scale, with a chromatic note inserted between the 5th and 6th degrees. C(1), D(2), E(3), F(4), G(5), G#(chromatic note), A(6), B(7), C(1). A Dominant Bebop Scale is based off the 7-note mixolydian scale, with a chromatic note inserted between the b7th and the root. C(1), D(2), E(3), F(4), G(5), A(6), Bb(b7), B(chromatic note), C(1). First, we need to figure which bebop scales to play for each bar. If the chord is a Maj7 chord, we will play the major bebop scale that corresponds to that chord. If a measure contains a 2-5, we will only play the dominant bebop scale that corresponds to the 5 chord for that measure. Next, using those bebop scales we are going to anticipate each bar by 1 beat and descend from the root of the scale like in the example below. If integrating bebop scales is something you would like to work on, you can take this exercise even further by changing the direction or changing the starting tone. However, the priority is not so much being able to integrate every permutation of a bebop scale, but rather to understand the importance of the bebop scale and use the bebop scale of a guide for incorporating chromaticism with good harmonic timing. Bijan Taghavi is a pianist, composer, and educator currently based in New York, NY. For more information visit: BijanJazz.com. I play sax and studied bebop scales with one of my teachers, and it was a real eye opener or should I say ear opener.